All discussion must be based on a working document you did not write or contribute to, containing many paragraphs with which you strongly disagree, which will serve as the foundation of the conference’s final document. You will have only three minutes to speak to the group at large, on one day only. There will be no general discussion on changes to the working document or on any particular propositions concerning the issues under discussion. All discussion among the participants will be confined to small groups based on the language spoken. There will be no general voting on any particular proposition at any time. Two days before the end of the conference you and the other participants will be presented with a document drafted by the unelected central commission, nearly a hundred pages long and containing numerous detailed paragraphs, which purports to represent what you and the others have decided on the issues presented. You will have only half of that day to read, digest, object and suggest changes to this massive and complex document. On that same day the participants will have only two-and-a-half hours (from 4:30 in the afternoon until 7:00 pm) to present to the whole group their views on the contents of this document before it is resubmitted to the unelected central committee, which will supposedly incorporate any suggested changes, even though none have been voted on. On the very last day of the conference you will be asked to vote YES or NO on the final document as redrafted the day before by the central committee, with no further changes permitted. This document will be presented to the world as what the conference has decided. The required vote for passage of the document is stated to be a 2/3 majority, but this can be changed to a simple majority at the whim of the sponsor. Imagine all of this and you will know what it is like to be attending the Phony Synod of Pope Francis. You will not be allowed to know who said what during the three-minute speeches. You will not be allowed access to the conference hall or to the participants as they come and go from the hall. The sponsor will not give you any information about the conference proceedings beyond one-hour briefings, conducted at an entirely different location, during which someone will purport to summarize what each of the language groups is discussing. Even if you succeed in obtaining an interview with one of the participants, he will be allowed to tell you only what he has been saying during the conference, but will be under a vow of secrecy as to what the others have said orally or in writing. You will be denied a press pass, or your pass will be stripped from you, if you have written, or come to write, anything that displeases some unknown member of the sponsor’s press office. Imagine all this and you will know what it is like to be a member of the press covering the Phony Synod of Francis. What is the point of this whole sham? Only the obtuse still fail to see it: to provide the appearance of a Synod so that the final document, which has already been written and reflects what Francis and his collaborators have already decided, can be declared to be the Synod’s will and the voice of “the Spirit” speaking though the Synod Fathers. As this sham enters its final week, walking out is the only course that remains to the participants if they wish to avoid having their names attached to what threatens to be a disastrous outcome: an insane “regionalization” of the Church’s moral doctrine on marriage and procreation, to be applied or relaxed as each bishop or bishop’s conference sees fit in the exercise of “mercy,” while the doctrine is hypocritically maintained in principle. This would mean the destruction in practice of the universality of the Church — the worst thing that has happened to her in 2,000 years of relentless attacks by the Adversary, exceeding even the Arian crisis at its height. We have reached what must surely be the final stage of the post-conciliar revolution in the Church. 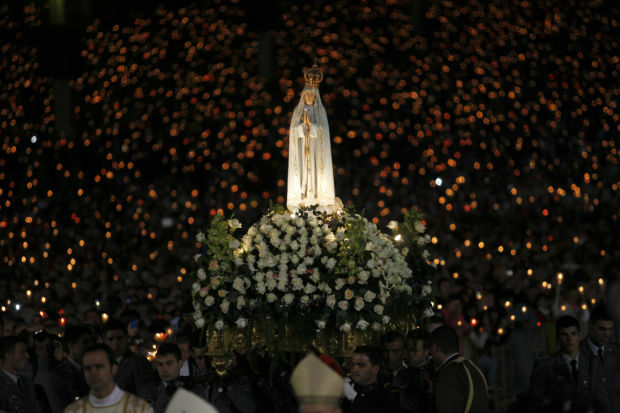 Only the integral Third Secret of Fatima, including the missing words of the Blessed Virgin, can tell us with certainty what will happen next. You will open your eyes Joe as many other, the day of the Warning, that day you will understand the meaning of the end of the times, that day only and not before, do not believe a second that God will send a Warning if we had a Saint in Rome, for those who believe that, shows a lack of knowledge about the Apparitions of Garabandal. What kind of water do they get to drink during these meetings at Rome? Are they suggesting the creation of Catholic “offshores” of mercy? There are approximately 50 countries in Europe, 30 of them belong to the borderless Schengen Area. They may need to publish a new Michelin Guide for Doctrine/Pastoral issues, so we’ll be able to know what kind of sins are allowed over that bridge and behind that hill. There are almost 200 countries in the World where you can count over 3100 Catholic dioceses, or equivalent ecclesiastic jurisdictions. The Roman Catholic (meaning Universal) Church is the mystical body Christ, not just an amount of body parts. If this viral iniquity becomes approved, we won’t get one schism in the Catholic Church but several, perhaps even in the same country! That would be the call to Our Lady of Garabandal. Yes Basto, this is their plan so de facto the end of Peter, unacceptable and this will lead us to a biblical punishment from God, next year should be a year for the blind, time will tell.